sevens while dealing with a corner, David McKenna getting the final touch at the back post. Parity was restored in the 29th minute, Ryan McGregor letting fly from 20 yards with a wicked swerving effort which left Stephen Grindlay rooted to the spot. ‘Lok edged ahead in the 34th minute, Stef McCluskey whipping in a free-kick from the left, Bryan Young’s back-header beating Grindlay all ends up. 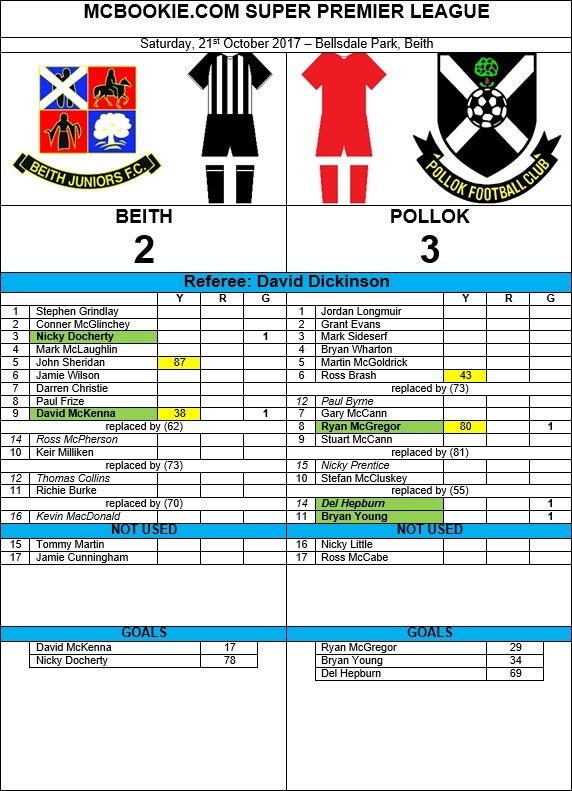 The visitors doubled their advantage in the 69th minute, Stuart McCann harrying the Beith rearguard into presenting Del Hepburn with the chance to beat Grindlay to the ball, and head over the advancing goalkeeper. The Mighty reduced the arrears in the 78th minute, Nicky Docherty looping a header over Jordan Longmuir after ‘Lok failed to clear their lines from another flag kick. Today’s referee is Cat 1D official David Dickinson from Renfrewshire. last week he took charge of Formartine United vs. East Stirlingshire in the Scottish Cup. Lok last saw him when he presided over the match vs. Kilbirnie earlier on in the season. He will be assisted by Brian Christie and Shaun Ferguson.